You may receive updates from Just Peace Advocates, the sponsor of this letter campaign. You may receive updates from Just Peace Advocates, the creator of this letter campaign. I write because I am shocked, ashamed and saddened to hear of your recent trip to Israel to "learn about accessibility." Israel is responsible for disabling and murdering countless Palestinians. In the past few months alone, Israeli snipers have targeted journalists, paramedics, people with disabilities, women and children with fatal sniper shots during the Great March of Return. 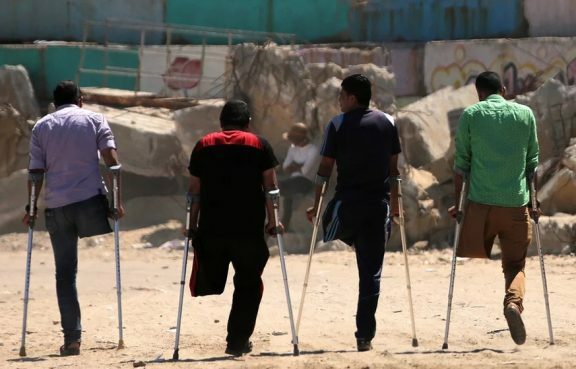 Over 200 Palestinians have been killed, and tens of thousands have been injured, often with non-fatal shots to the chest, back, or legs, ending in disability. Even as your institutions were leading this tour, the report was released on February 28, 2019 by the independent, international commission of inquiry (the Commission) which was established by the United Nations (UN) Human Rights Council, in resolution S-28/1 of 18 May 2018 to “investigate all violations of international humanitarian law and international human rights law in the Occupied Palestinian Territory [OPT]… in the context of the military assaults on the large-scale civilian protests that began on 30 March 2018” and “to identify those responsible, to make recommendations, in particular on accountability measures… and on protecting civilians against any further assaults”. Subsequently, commissioners Santiago Canton of Argentina (Chair), Sara Hossain of Bangladesh, and Betty Murungi of Kenya were appointed to the Commission by the President of the Human Rights Council. The Commission’s findings, as detailed in a preliminary report submitted today to the Council (A/HRC/40/74), largely reflect information documented and submitted to it by Al-Haq and other Palestinian human rights organisations. According to the Commission’s Chair, Santiago Canton, “[t]he Commission has reasonable grounds to believe that during the Great March of Return, Israeli soldiers committed violations of international human rights and humanitarian law. Some of those violations may constitute war crimes or crimes against humanity, and must be immediately investigated by Israel”.Indeed, the investigation found that, between 30 March and 31 December 2018, Israeli soldiers killed 189 Palestinians during the Great Return March protests in the occupied Gaza Strip, and that over 6,000 Palestinian protesters were injured by live ammunition." The findings confirm that Israeli forces “killed and maimed Palestinian demonstrators who did not pose an imminent threat of death or serious injury to others when they were shot”, violating their inherent right to life. 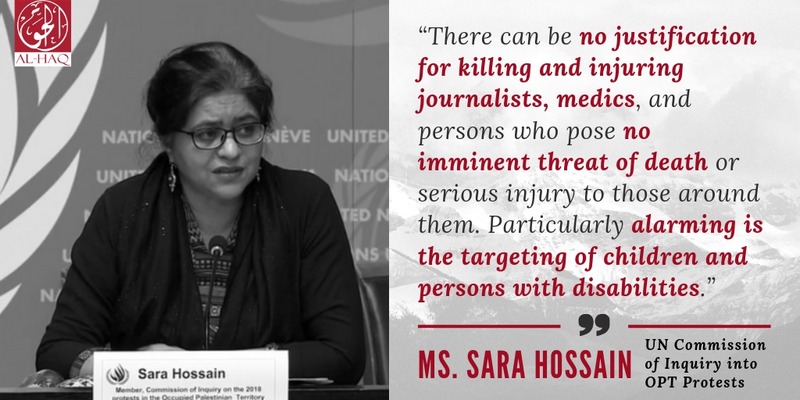 Commissioner Sara Hossain stated: “[t]here can be no justification for killing and injuring journalists, medics, and persons who pose no imminent threat of death or serious injury to those around them.” As such, the Commission concluded that the Israeli army’s intentional use of lethal force against Palestinian protesters may amount to war crimes and crimes against humanity and requested the UN High Commissioner for Human Rights to refer these findings to the International Criminal Court (ICC). This is to be taken seriously by the international community, and surely leading organizations such as your own would not wish to be associated with supporting best practice sharing with a state that is causing disability, but covering it up with accessibility-washing. Doctors Without Borders has also reported that these snipers are using expanding bullets to effect maximum injury, meaning that limbs require amputation. These bullets are banned under International Law. Patients in Gaza face severe restrictions on medicine due to Israel's ongoing illegal blockade, and patients with severe illnesses such as cancer are frequently prevented from leaving to access treatment. Even children who need cancer treatment when provided permission to leave Gaza are often are forced to travel without their parents. This is not to mention the severe psychological trauma and disability that Palestinians face living every day under the brutal, illegal, inhumane Israeli occupation. In fact, part of the strategy of the occupying force is to cause disability to remind people of the impacts of any even non-violent resistance such as holding a flag. This is, in no way, a model of accessibility! These are violations of the right to health, as well as crimes against humanity and war crimes! I support human rights for Palestinians. I support accessibility for all people. I certainly hope that Holland Bloorview, March of Dimes and Accessibility Ontario and the Ontario Government AODA leadership are leading the way in both obtaining and sharing best practices. However, it is shameful, and in fact complicit with war crimes for Canadian organizations to seek out accessibility innovation from the very state that inflicts war crimes against the people that it is responsible for providing protection to as the occupier (as per the Fourth Geneva Convention). This is shameful, and so I join in calling for an immediate public apology from all those involved! All organizations involved in this trip should also have an internal dialogue about how and why this trip was allowed to happen in the first place, and make sure it never happens again, including this information for transparency to the public. 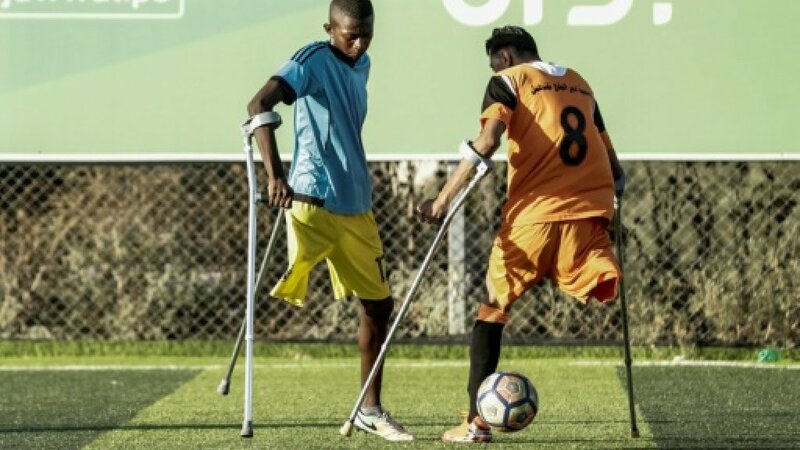 Also, steps need to be taken to ensure your organizations provide support to those organizations within Palestine that are providing services to those who are suffering from disability inflicted by the Israeli military. I look forward to hearing from you on what you will do to publicly rectify this situation.